Andrea was extremely helpful and responsive to my questions and gave me the support and direction I needed during a difficult period. She’s professional and knowledgeable and I highly recommend her. Andrea is a passionate family law attorney who really cares about her clients. She's smart and competent in representing individuals in a wide variety of dissolution, child custody, and domestic violence matters. A committed, competitive family law attorney, Andrea Seymoure has an eye for detail and deep dedication to her clients. She’s a strong advocate and skilled litigator, and a valuable asset in divorce, custody, and other family law matters. Helping people through a difficult, potentially scary moment in their lives is what draws Andrea to family law. She wants to help clients navigate emotionally trying times, make them feel heard, and protect what they value most, offering practical as well as legal advice. She loves kids and is especially passionate about cases involving children. Andrea brings a unique perspective and a diverse professional background to Goldberg Jones. Though primarily focused on family law in her career, she has also worked in real estate, business law, and landlord-tenant disputes, among other areas. Andrea received her bachelor’s degree in International Studies from the University of Washington. Following that accomplishment, she earned her Juris Doctor from the Seattle University School of Law. 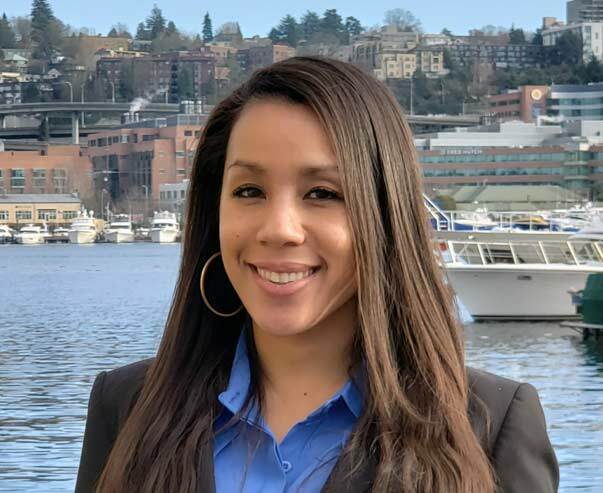 In addition to her professional work, Andrea volunteers her time with groups like the Eastside Legal Housing Assistance Program and the King County Bar Association’s Housing Justice Project, helping underrepresented people obtain much-needed legal services. When she’s not fighting for the rights of her clients, Andrea enjoys spending time with her young daughter, travelling and exploring new cities, doing yoga and barre, and tackling DIY home improvements.